You can believe in Landlords income properties for a lot of reasons. When you buy an income property as an investment, you gain two major ways to make money — the value of your property could increase over time, and you can make money in the meantime (or indefinitely, if you never sell) by charging rent. But that doesn’t mean that income properties are completely foolproof moneymaking schemes. Landlords need to be careful and attentive, because rental properties face certain risks. A little knowledge goes a long way toward protecting your interests, though, so read on. 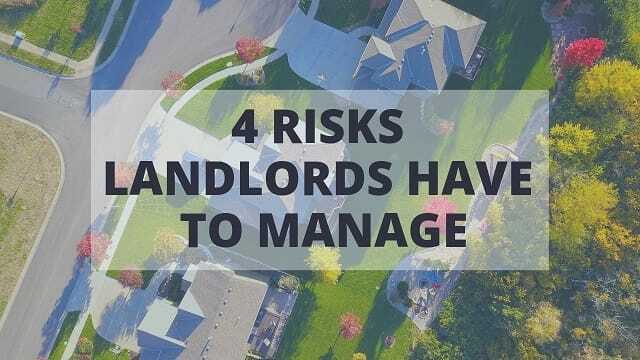 Here are four major risks that landlords have to deal with, along with tips for managing those risks. Real estate is a great investment because, over time, the real estate market tends to go up. But the fact that the real estate market tends to grow in value does not mean that individual properties or markets in certain areas will never slump in the short term. If you’re not careful — or even if you’re just unlucky — you could see your pricey investment grow less valuable, and could even struggle to find tenants. Managing this risk means being extremely careful when you make the decision to buy a real estate property. Do your research and know your local real estate market so that you can be as sure as possible that you’re making the right call on which property to buy and when to buy it. And consider your financial means, too. Can you afford to buy this property and still weather tough times? It’s not a good idea to invest in a property that you might have to sell if the local or national market took a step back — you want to have the flexibility to hold on and keep an eye on long-term goals. Real estate tends to go up in value over time, but that’s not because homes and other buildings grow stronger or more reliable. No, it’s because of the land beneath them — the structures themselves, on the other hand, tend to depreciate over time. You don’t want your property to become less valuable, and you certainly do not want to let things get out of hand and trigger a serious disaster in your space. So keep up with your real estate property needs: Be proactive about maintenance. Be sure to get landlord insurance, too. It’s always better to be safe than sorry. No matter how careful you are about your maintenance, your real estate property faces certain unavoidable risks. You can reduce the risks of things such as fires and water damage by caring for your property’s electrical and plumbing systems, but you’ll still face risks from Mother Nature and other outside sources. Your rental property is always at some degree of risk of fire and other disasters. So what can you do? Besides being proactive about insurance, your main action here should be to invest in the proper insurance policies and riders that you’ll need to recover financially if disaster strikes. Income properties only generate income when they are occupied by paying renters. Unfortunately, problem tenants can wreak havoc on your investment plans. Deadbeat tenants will render your income property unprofitable. Destructive tenants could even actively damage your valuable space. That’s why it’s so important to perform a proper tenant background check and credit check before you rent to anyone. Your risk of dealing with a problem tenant will be drastically reduced if you take the time to vet potential residents.